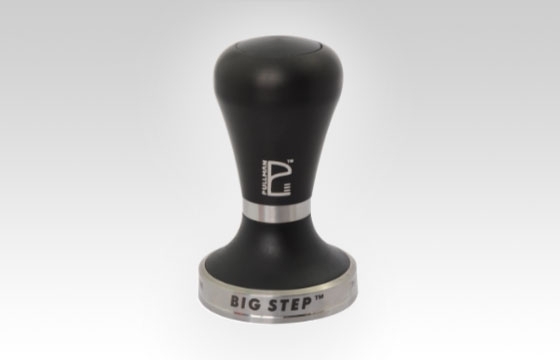 Pullman Tamper with BigStep Titanium Base. The Barista tamper is Pullman's flagship product, perfectly complemented by the precision and balance of the Big Step base. Offering a great blend of style and durability, useful for both commercial and home use. Originating from discussions with 20 year industry veteran and 2015 QLD Barista Champion Adam Metelmann, the BigStep base was born out of his desire for a base with the highest possible useable tolerance in size for competition baskets. This base is made from an extremely high strength (min 40 Rockwell) 630 Grade Stainless steel in Australia from premium grade materials. This base is also up to 30g lighter than standard Pullman Barista bases providing a more balanced feel of weight distribution from top to bottom when in use and handling the tamp. The BigStep refers to the design of the larger diameter 'stepped edge' measuring in at 58.55mm (+/- 0.03mm). This base shape enables a maximum surface area of coffee to be covered during tamping, including the prevention of a pinched edge of coffee particles or vacuum effect that can occur when using such a large (or incorrectly) sized base. This design can be used with all variations of dose weights (low dose/high yield or high dose/low yield).